Problem spaces. We all know them and we all...well....avoid them. 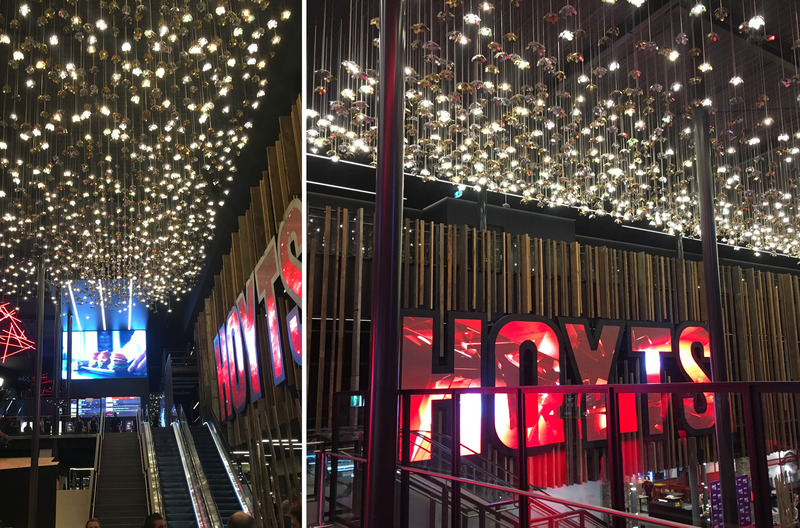 In the case of Hoyts cinema located in New Zealand, at the Westfield Riccarton shopping center, Yellow Goat took one problem space from frustrating to fantasy with a little ingenuity and a green (and gold) thumb. 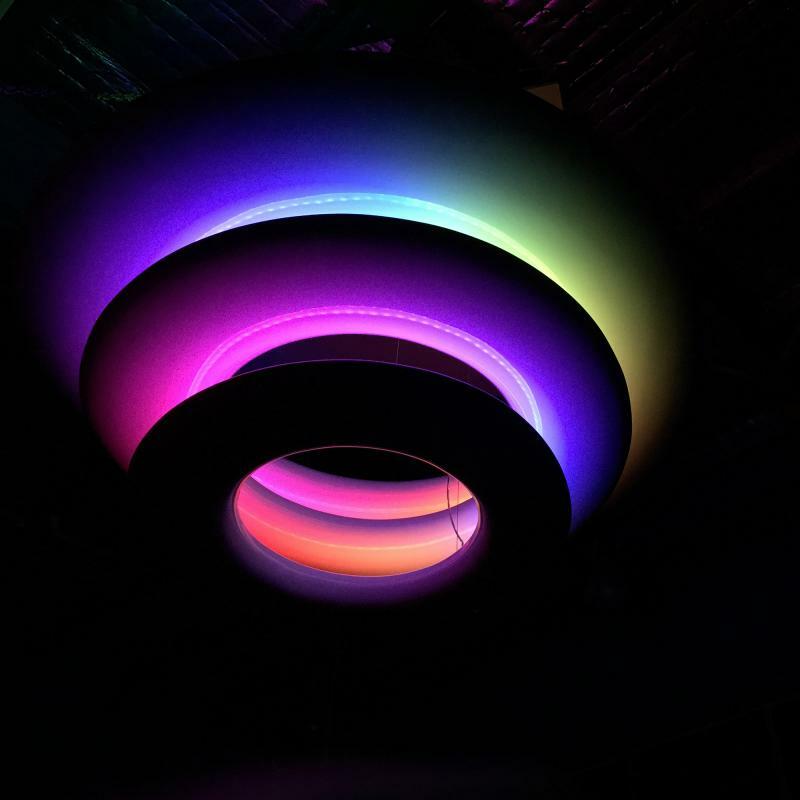 Aptly called our 'Field of Dreams,' our Design Director, Jerzy, collaborated with Lume Design (a long-time friend and client) to create a garden in the sky. 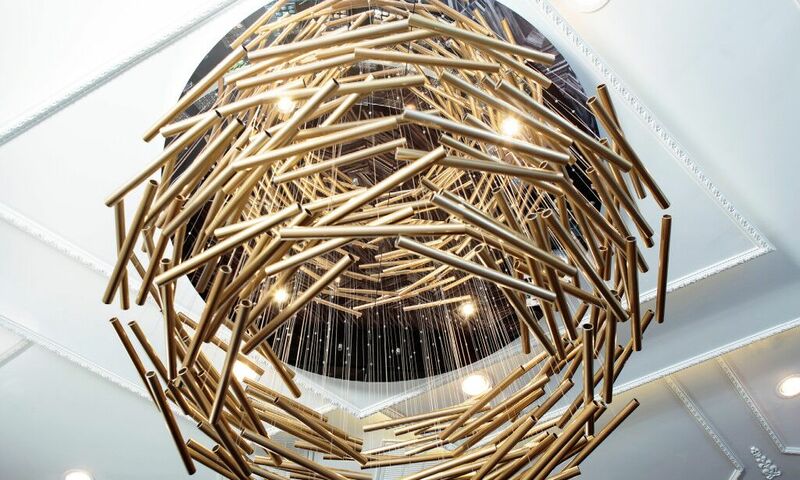 Designed by Jerzy to reflect Christchurch's history of greenery, water and flowers, the piece also draws focus to the theater's entryway and creates a space where people will come - again and again. It's officially our favorite time of year! As we dive into all things fall, rocking the latest boot (or bootie!) 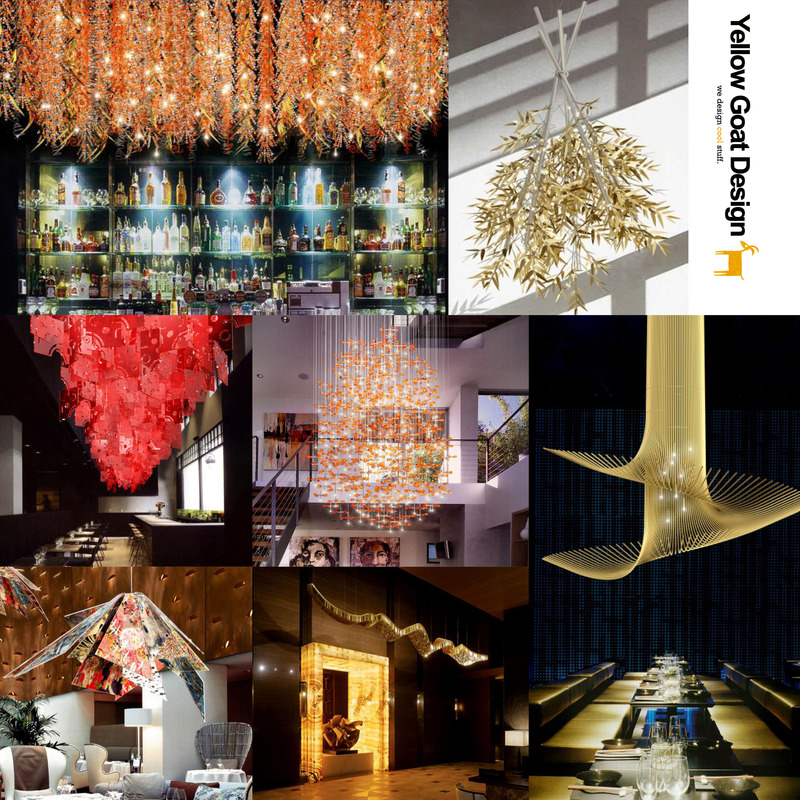 fad & sipping ALL the spiced lattes, we can’t help but highlight some of our own trending Fall Fantasy Fixtures that just might have you FALL head over heels in love with this season in a whole new light-one designed by YGD. 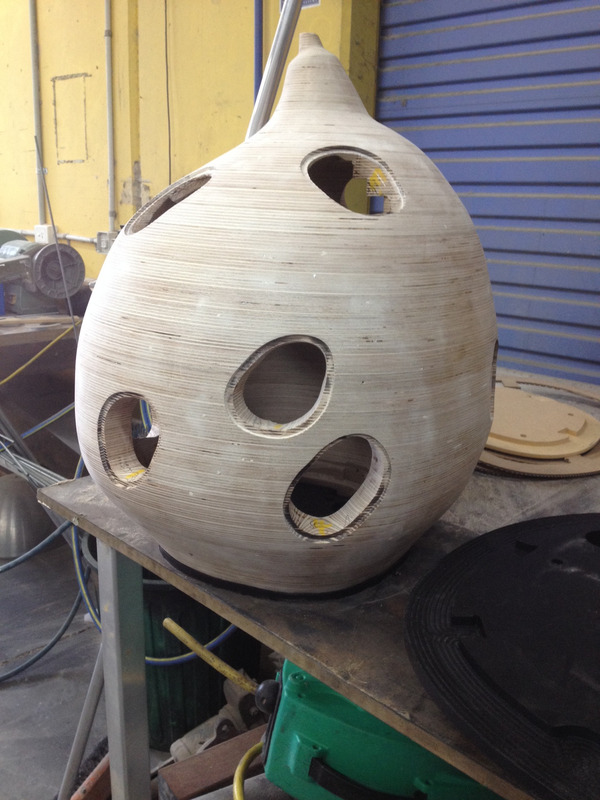 And DON'T FORGET you can customize anything…all designs are built to order! Looking for a little something to (pumpkin) spice up your design? Look no further! Yellow Goat has 8 new unbe-leaf-able options. From Art Deco to Nature Modern we’re bringing the most fall-hionable looks for September. 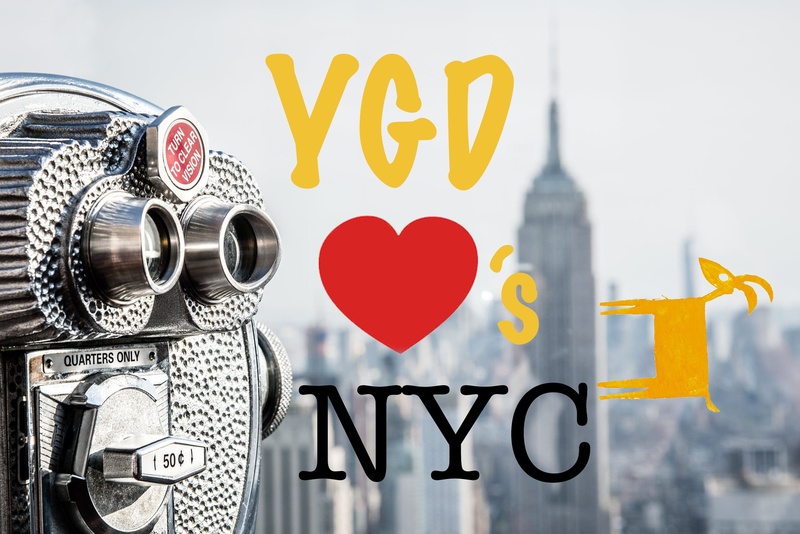 YGD Opens New York City Office! 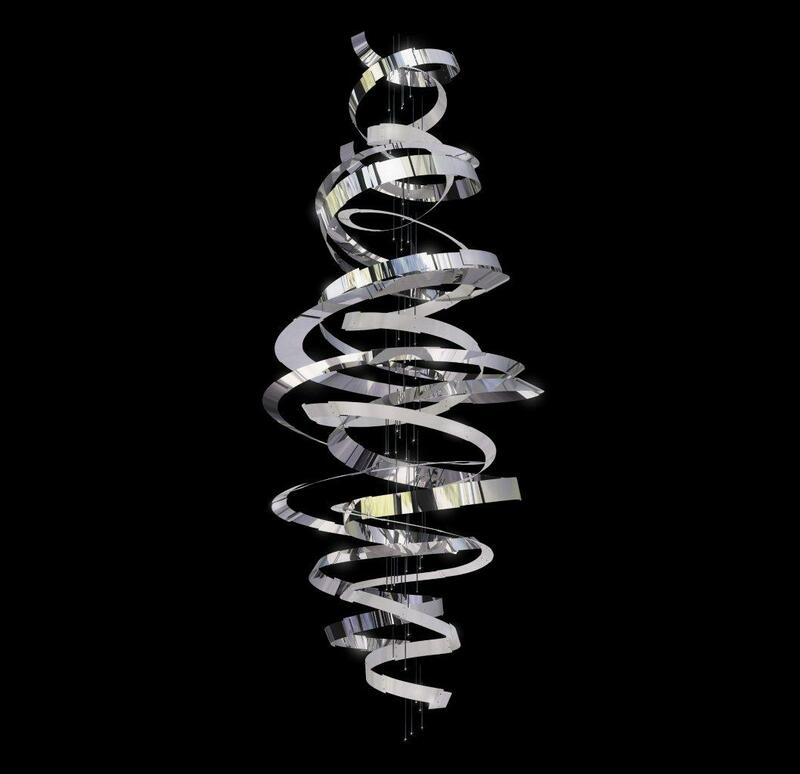 Wanna See a WOW Sculpture? Visit Art Van Furniture! Retailer Art Van Furniture rolled out the red carpet for their new flagship located in Canton, Michigan, U.S. It is the first furniture store in Michigan to be built ‘from the ground up’ in two decades(!!) 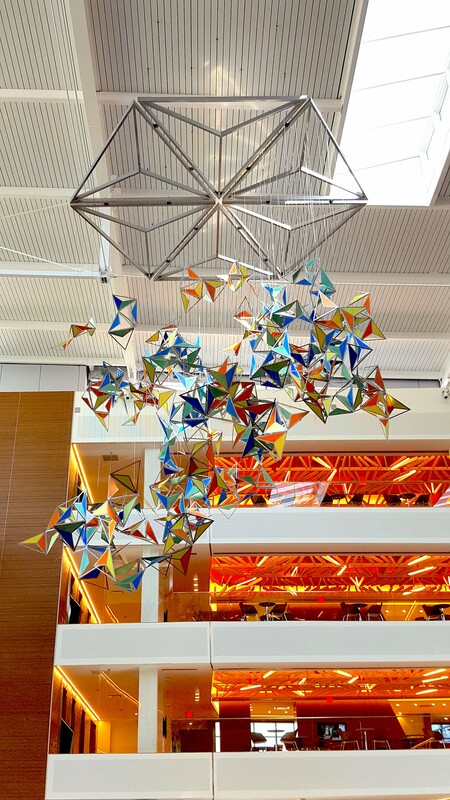 and warranted a ‘WOW’ sculpture to suspend over the feature escalators. 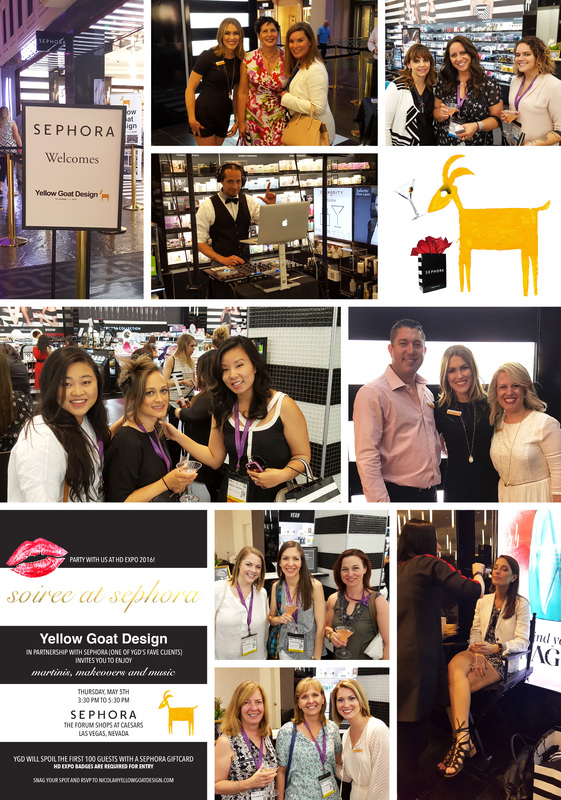 Well friends…it goes without saying that Yellow Goat is the go-to for your ‘WOW’ moment. Picture a perfect day: AM: lounging poolside with palm trees and a slight breeze. Afternoon: Chauffeured by a Mercedes for a mid-day shopping spree on Worth Avenue. 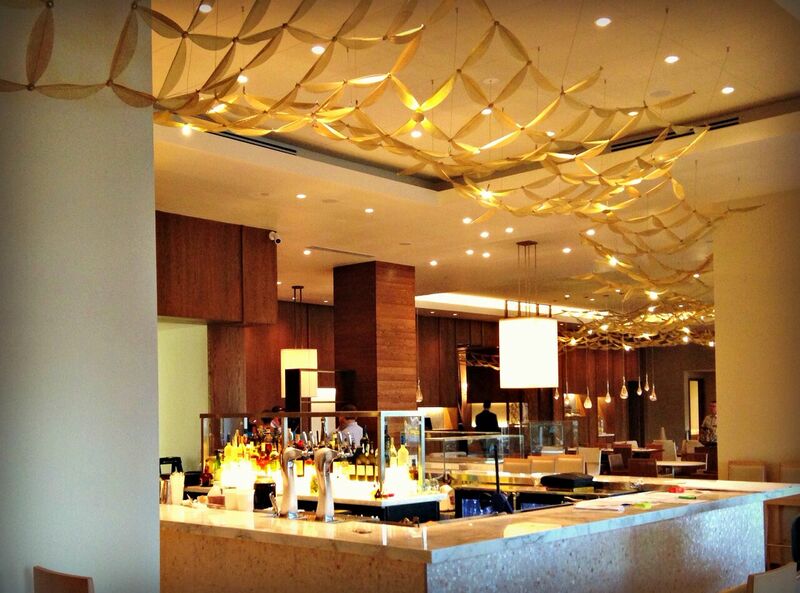 PM: waterfront dinner followed by a movie with your closest friends. Am I describing a vacation? For some. For others, this is every...single...day. 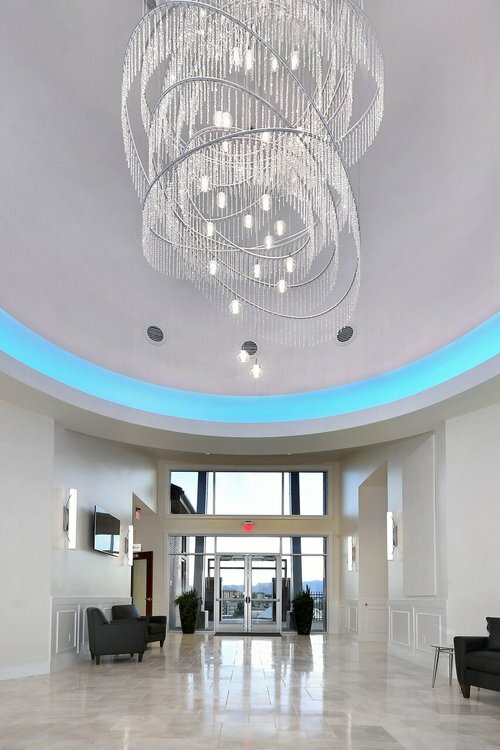 Let me introduce you to the MorseLife Stephen and Petra Levin Tower: the latest in luxurious independent retirement living located in Palm Beach, Florida, US. Want a Well-Balanced Space? Check Out our Project Pyramid! 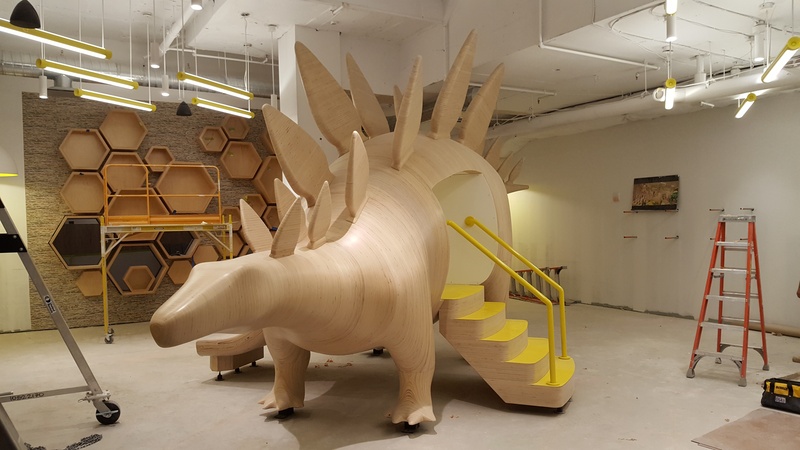 Washington, DC, USA may be the historic nation’s capital but the city is breaking ground on innovative workplace designs that are definitely not a thing of the past. 600 Massachusetts Avenue, designed by DC-based architecture and design firm CORE, is described as “Tomorrow’s Workplace, Today”. It is an environment that offers the perks demanded of today’s forward-thinking professionals. 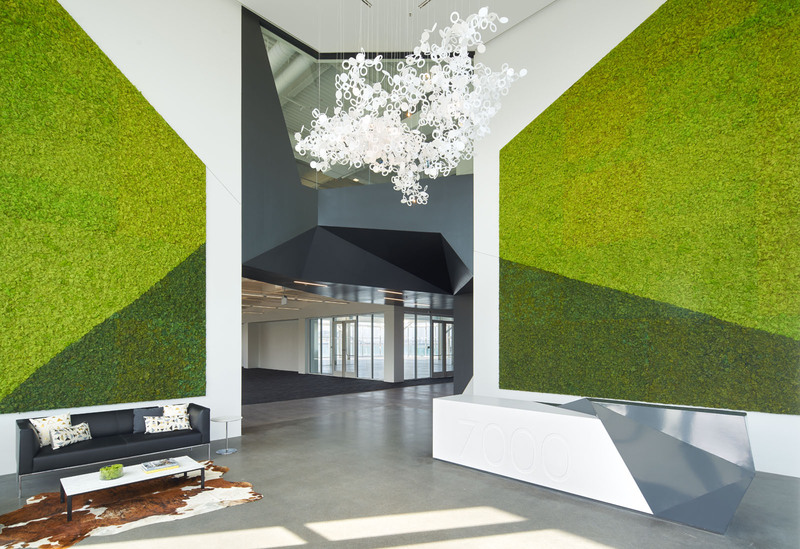 CORE captured this ‘city oasis’ by incorporating landscaped terraces, a rooftop garden, state-of-art fitness center and YGD’s organic “Promises Promises” light fixture in the double height atrium. It’s no surprise that CORE chose to collaborate with the Goat because we commit to design, fabrication & installation PROMISES we can keep. The Young Jewish Professionals, a New York-based nonprofit, has purchased and restored a 1900 Pre-War mansion just east of Union Square which serves as one of the most exclusive gathering and event spaces in the Big Apple. 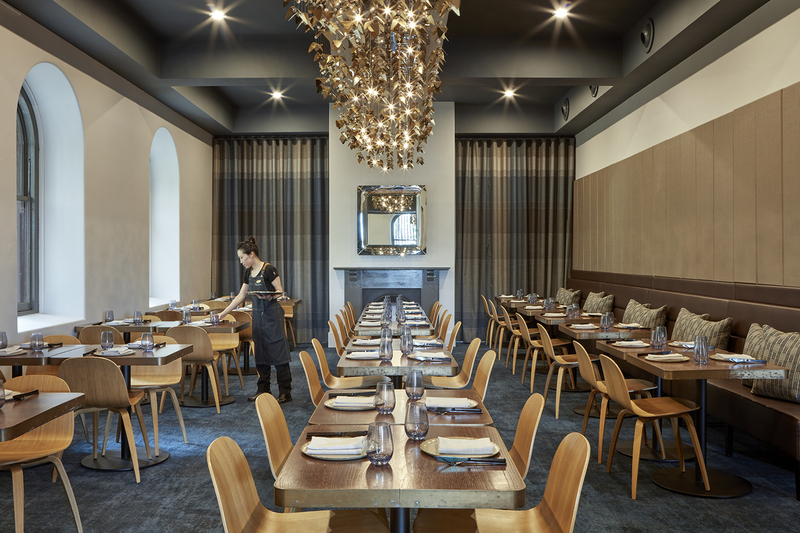 In celebration of the approaching Hanukkah holiday, the interior represents a Festival of Lights in its own right, illuminated with a jaw-dropping sculptural chandelier designed by yours truly. Dedicated to the creation of beauty, Body by Ravi is a medical practice specializing in plastic and reconstructive surgery in Houston, Texas. Led by Dr. Ravi Somayazula, it was time for their own facelift. 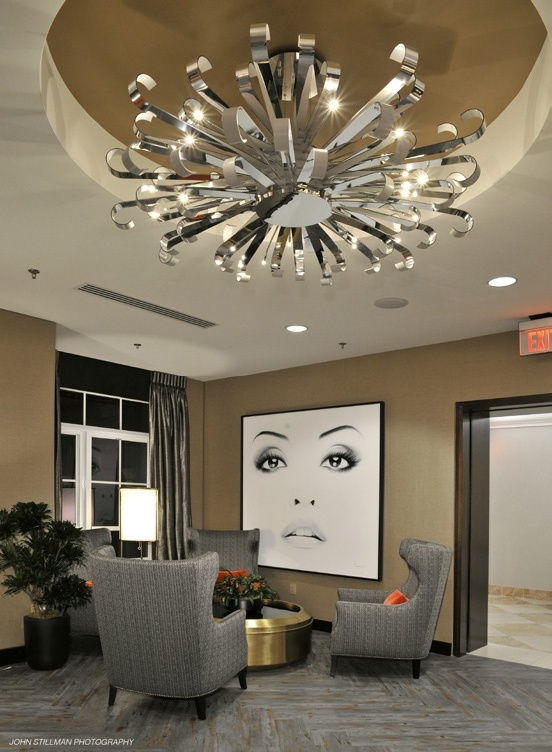 Contour Interior Design was called in to head up the interiors and create an elegant transformation. The selected focal feature? Yellow Goat Design’s “Curls Metallica” sitting pretty in the entry. Go ahead…bat those new Latisse eyelashes! Bristol-Myers Squibb is a global biopharmaceutical company that helps patients prevail over serious diseases through discovery, development and delivery of innovative medicines. #goals In order to strengthen this aspiring mission, the company needed to re-think their workspace. 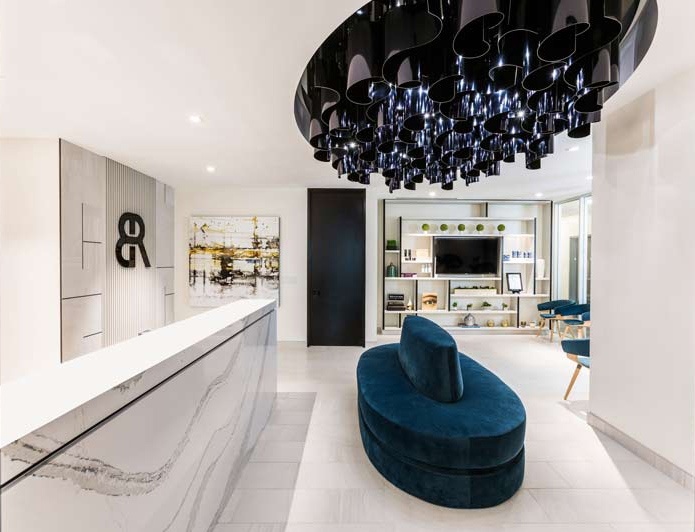 Not only are they geniuses when it comes to their own industry, they certainly prove brilliant in understanding the value of interior design and its positive impact on the work environment. 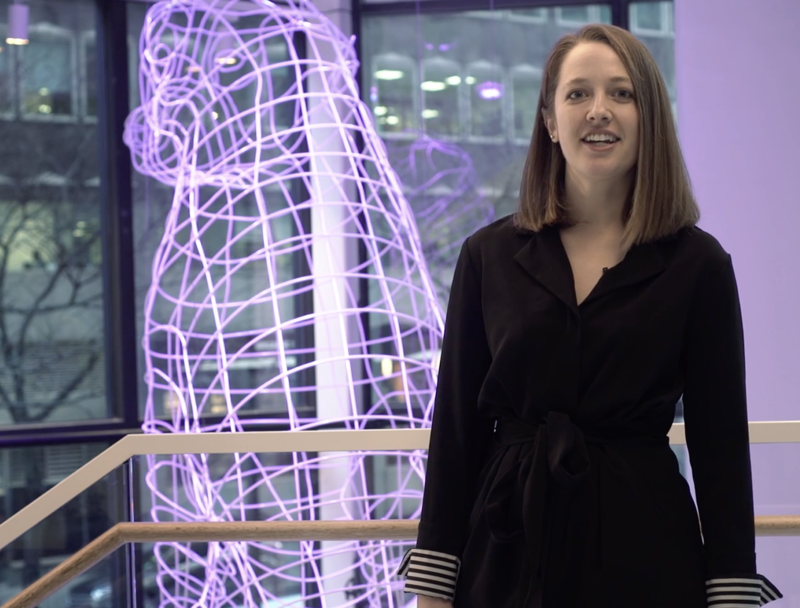 Offering employees an inspiring workplace is a proven factor in spurring creativity and innovation. To further demonstrate their savviness, they called in the big players- Gensler & YGD- forming an expert team to execute this tall order. “I dreamed all my life of the perfect store for women. 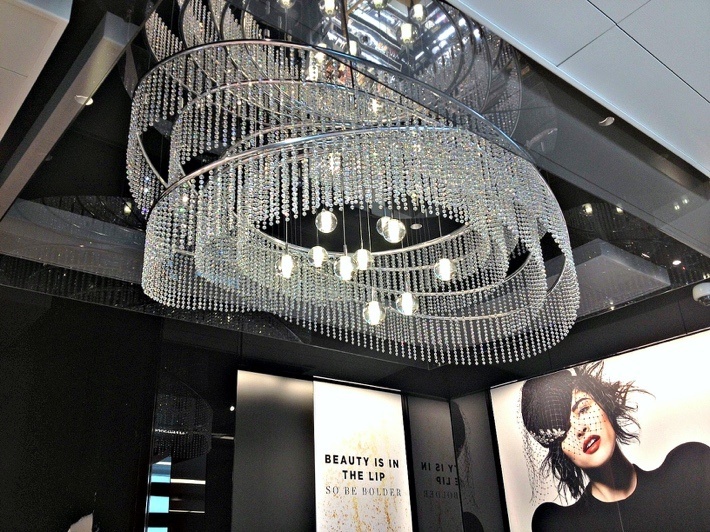 Then I saw Neiman Marcus, and my dream came true”. – Edna Woolman Chase, editor of Vogue (1936). We couldn’t agree more, Edna. 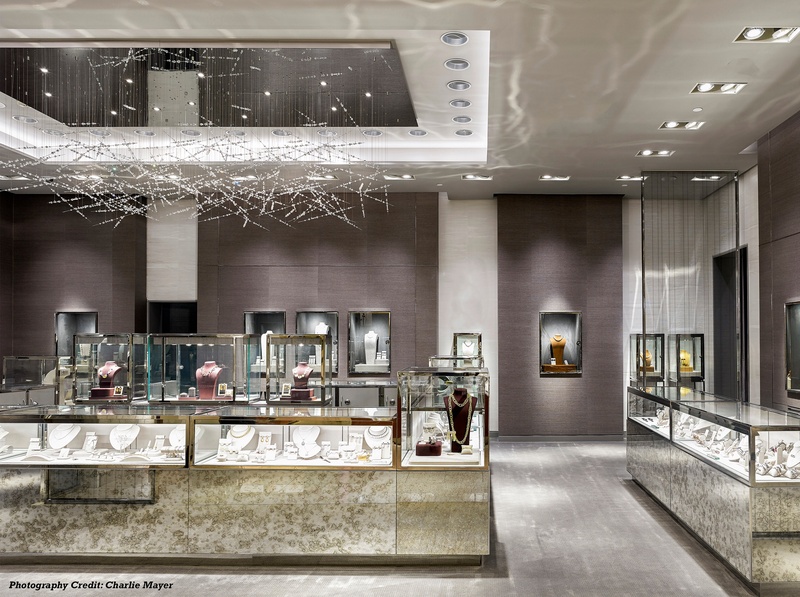 Our dream came true when Neimans and FRCH Design Worldwide asked us to collaborate on an installation at the White Plains, NY location. 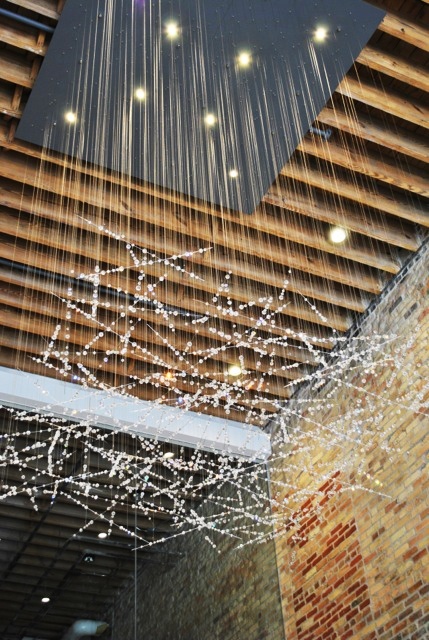 Let me introduce you to YGD’s “Shooting Stars” design, suspended and sparkling above Saint Laurent, among other designers, in the exclusive jewelry department. 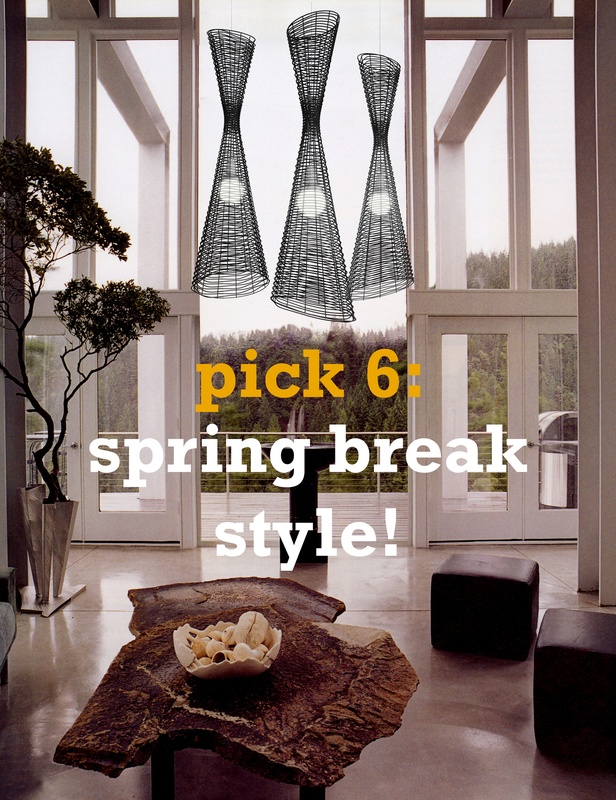 Pick Six: Spring Break Style! 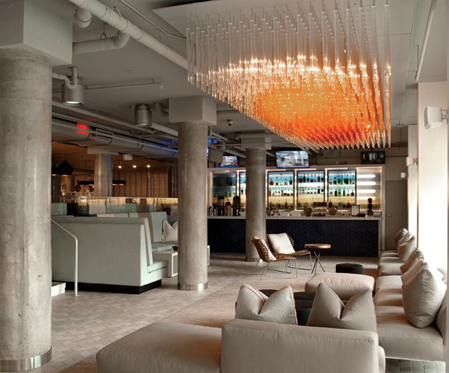 Designing a space that caters to spring breakers? Check out my top 6 picks for all your crazy cool clients crashing at hotels and resorts worldwide! 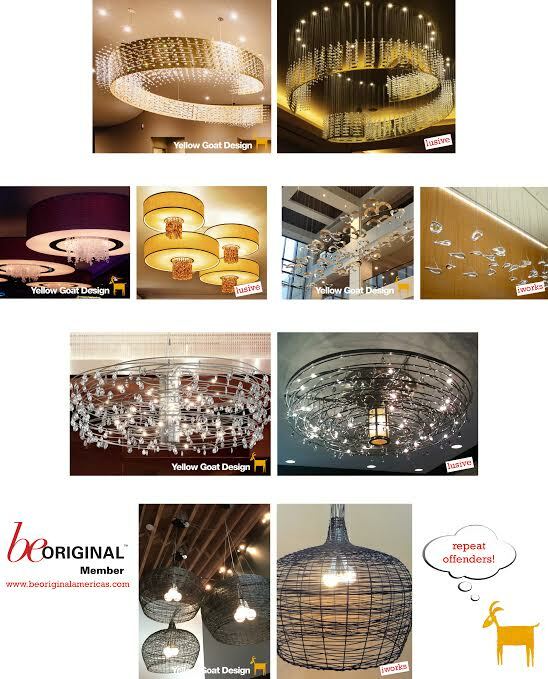 Are you at the end of your rope after searching hours on end for the perfect light fixture? 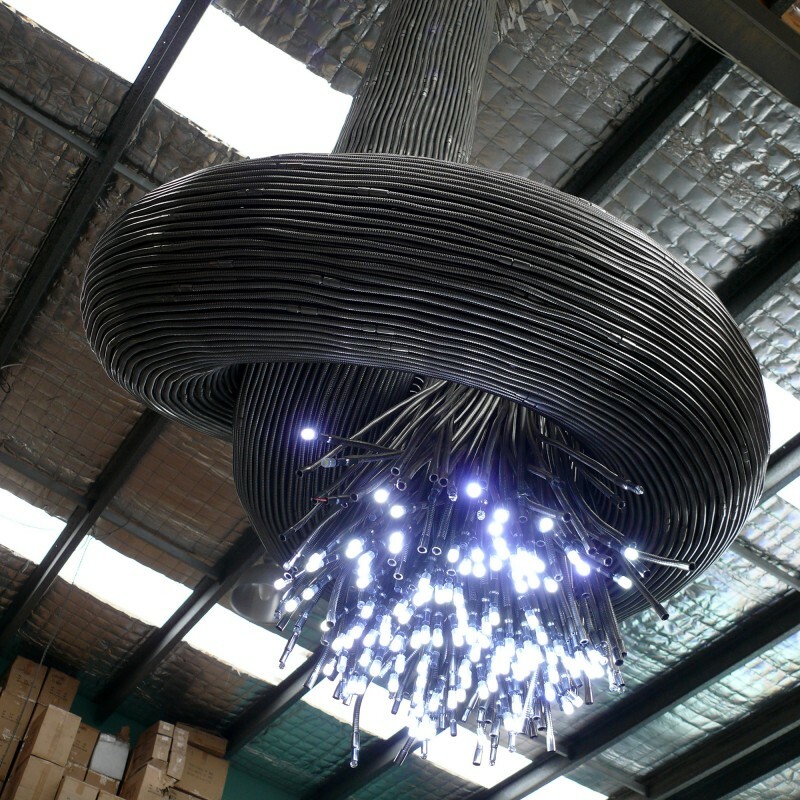 Here’s an idea: tie a knot and hang on…you’re about to experience the very best in innovation and design. 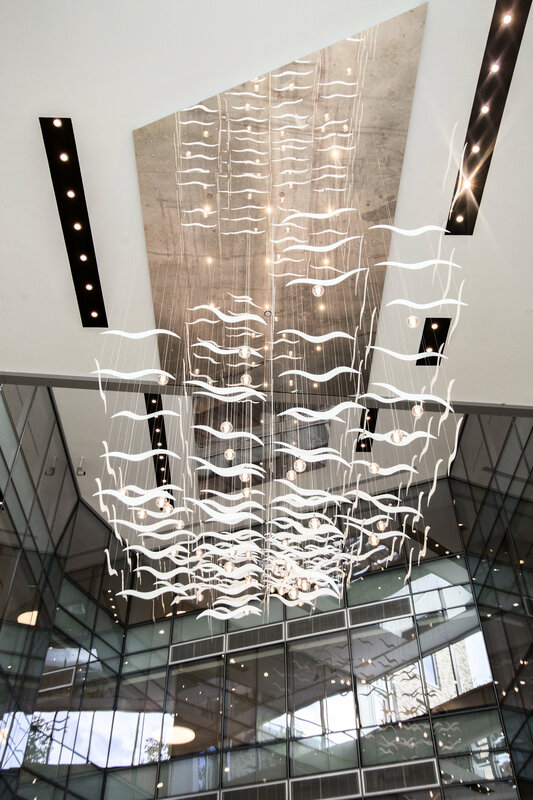 Introducing YGD’s “Knot”- a jaw-dropping display of large-scale lighting. In the spirit of the Valentine’s Day, let’s talk love! 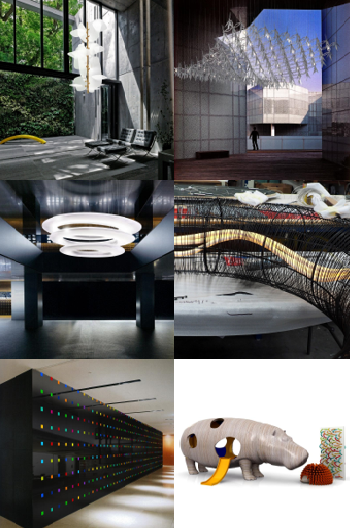 As many of our readers know, YGD has worked on projects around the world with a client list that is second to none. We love all of our clients…but a few are near and dear to our hearts. I believe one of our US-based clients, The Falls Event Center, would agree that we were truly meant for each other (just as Frank Sinatra says!). We know it’s Santa’s busy season…but our goats on the Gold Coast have also been bustling in the workshop! 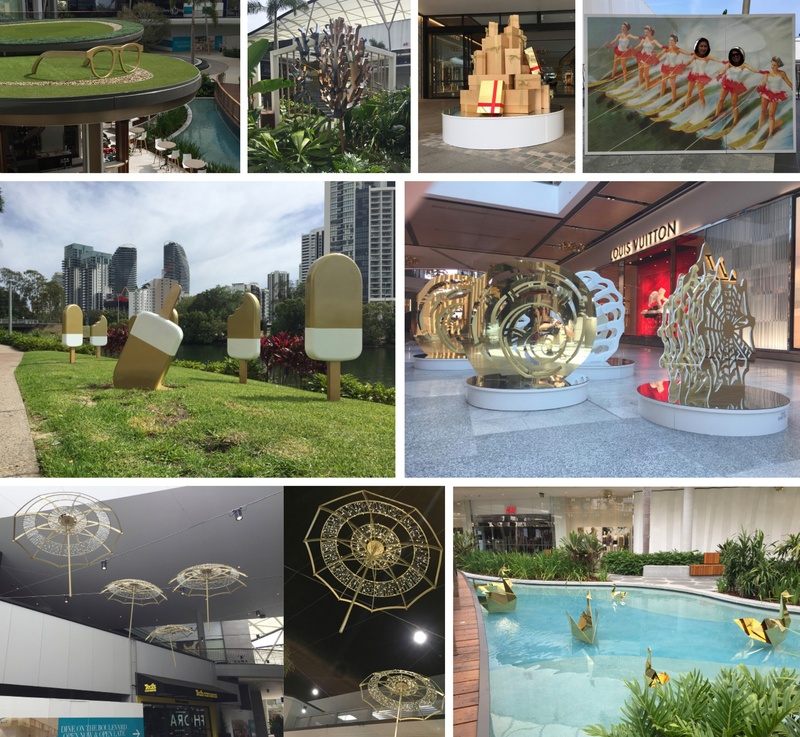 YGD’s HQ, located in Queensland Australia, was commissioned to provide eight of the twelve icons on display at AMP’s Pacific Fair shopping center’s “12 Days of a Gold Coast Christmas”. Contrary to the traditional song, these icons are designed Aussie style! I can’t think of a better way to countdown to Christmas. Palm trees and 80 degrees? Yes please! YGD is Very Hungry for…Furniture? Eric Carle…the name sounds familiar right? 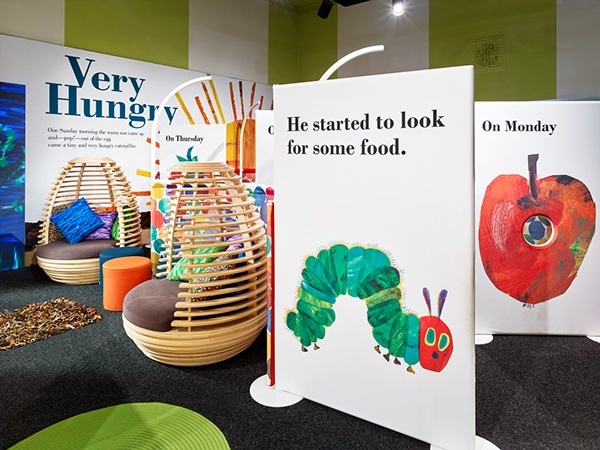 He’s a starchitect in his own right: he designed the classic children’s book “The Very Hungry Caterpillar” in 1969 that we all know and love. 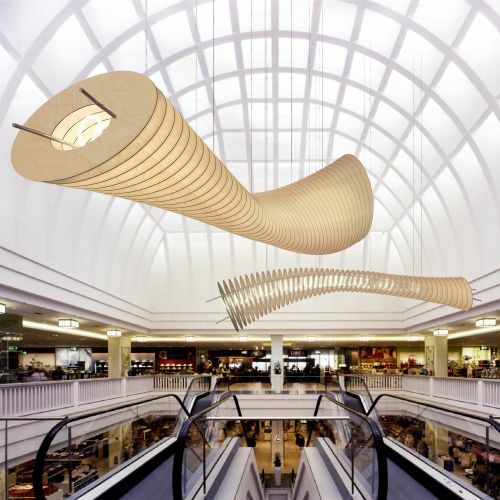 The story is based on the principle of transformation…a concept that we are very familiar with here at YGD (shout out to our multiple product lines: lighting, screens, cirrus, kids play!). Based on Carle’s concept and a new exhibit featuring his work, our “Cocoon” Chair has been born, adding ‘furniture design’ to our ever-expanding list of capabilities. 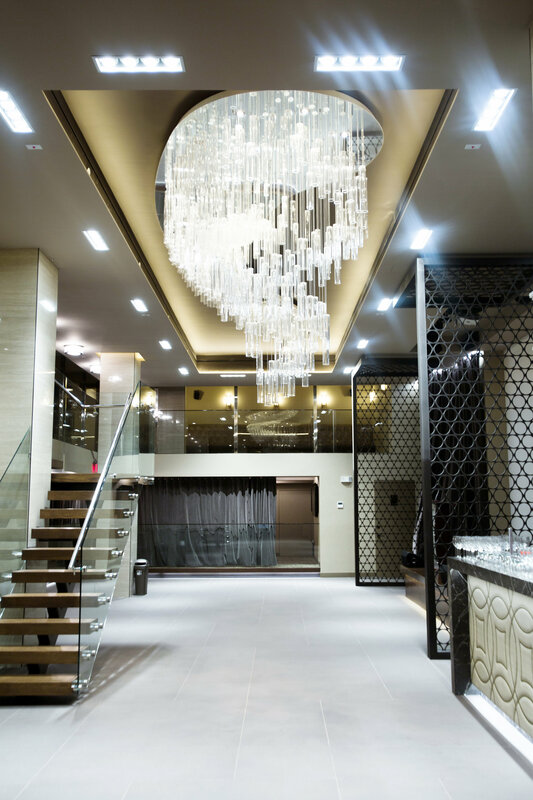 CetraRuddy, Manhattan based architecture and interior design firm, has cooked up a hot new high-rise in NYC’s Hell’s Kitchen. 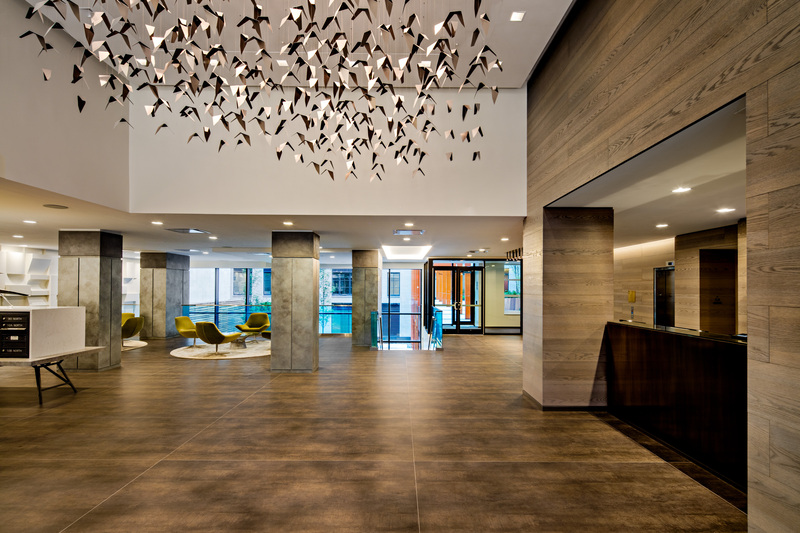 Let me introduce you to 535w43, a site comprised of two 14-story buildings that provide luxury apartment living in the heart of the concrete jungle. This haven features a rooftop garden, skyline views and central courtyard gardens with glass-enclosed walkways that bridge the two buildings. 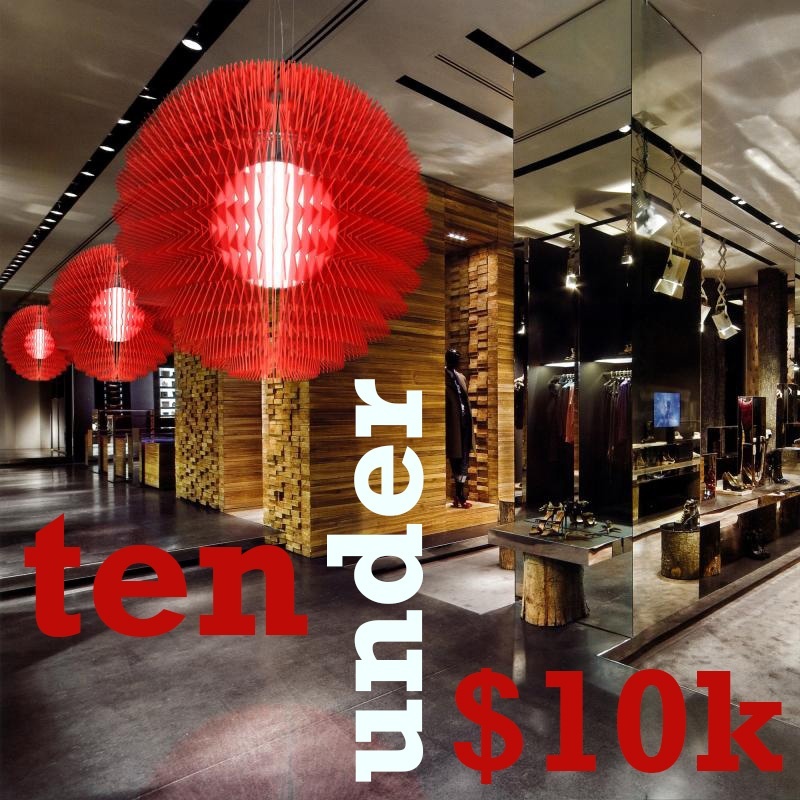 Do you have a tendency to search for unique lighting options that still make an impact within a $10k budget? I know you’re out there…I received over 12 requests this week from my fellow designers (sending shout outs)! Let me do the leg work for you. 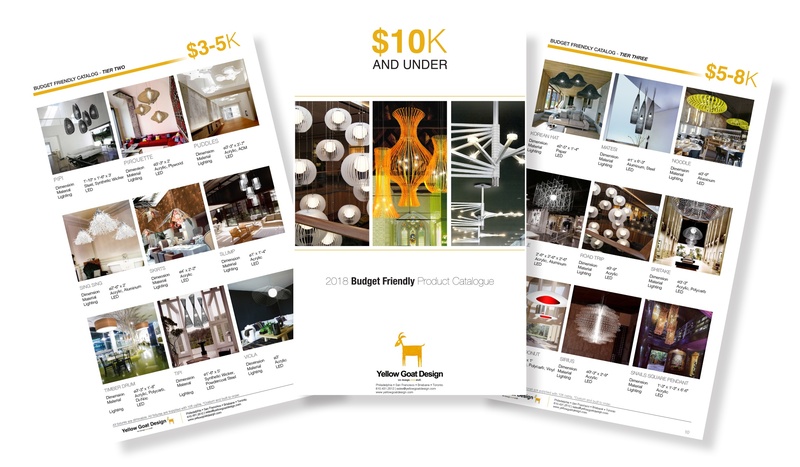 I pulled 10 Yellow Goat Design fixtures that each price under $10k, in a mix of materials and aesthetics, to suit all sorts of interiors. Check them out. Don’t (web) surf away- this is not a geometry lesson. Instead, it IS a lesson on how a beach house can benefit from an array of triangles…and how Yellow Goat Design will nail the right angle for your project (pun intended)! Situated in the ocean town of Trigg outside of Perth in Western Australia, a family commissioned Hillam Architects to design what the architect calls “A stairway to beachside heaven”. The private residence, located on a prominent corner, is inviting for both friends and fanciers. Lincoln Motor Company just opened its first 5,200-square-foot experience center and let me tell you…it’s a force to be reckoned with. 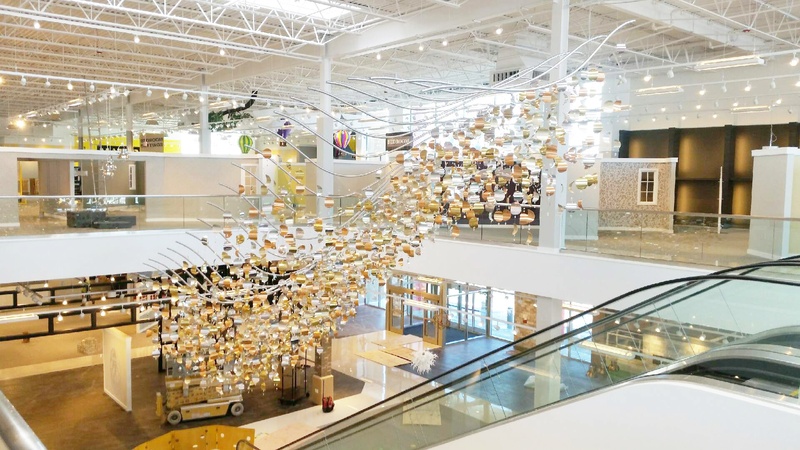 Located at uber-luxurious Fashion Island in Newport Beach, California, the Lincoln Experience Center shares retail space with the likes of Louis Vuitton, Neiman Marcus and SoulCycle (for any of you that know me personally…this is my idea of a good time). 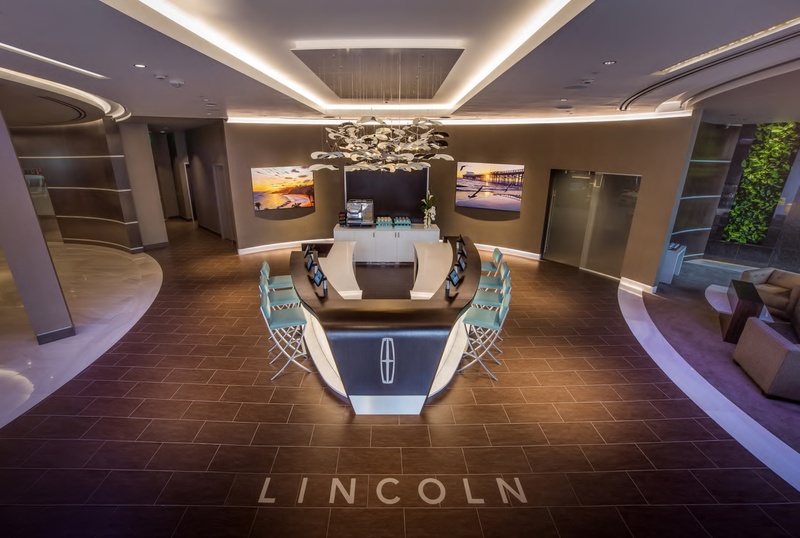 Lincoln took note and seized the opportunity to supply their customer base with an introduction to “The Lincoln Way”, designing a space with sleek architectural accents and a stylish interior. Hey Yellow Goat Groupies! Nicola here (your US Design Manager). I get this question a LOT: where the heck are you located?! So confusing, I know. Thought I’d take a moment to clear it up. This will be short and sweet… stay tuned for a longer blog on our design process next week! 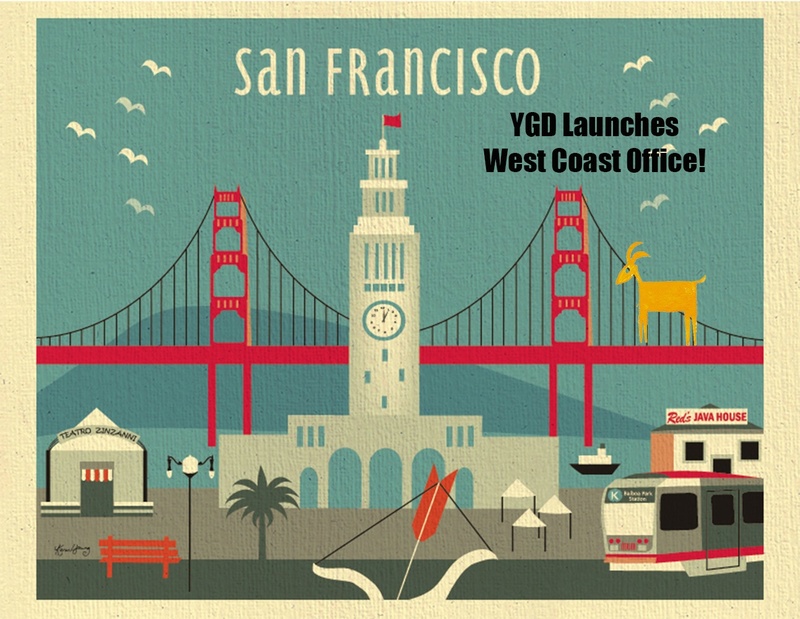 Hot off the Press…YGD’s Newsletter is a Reading Fest! 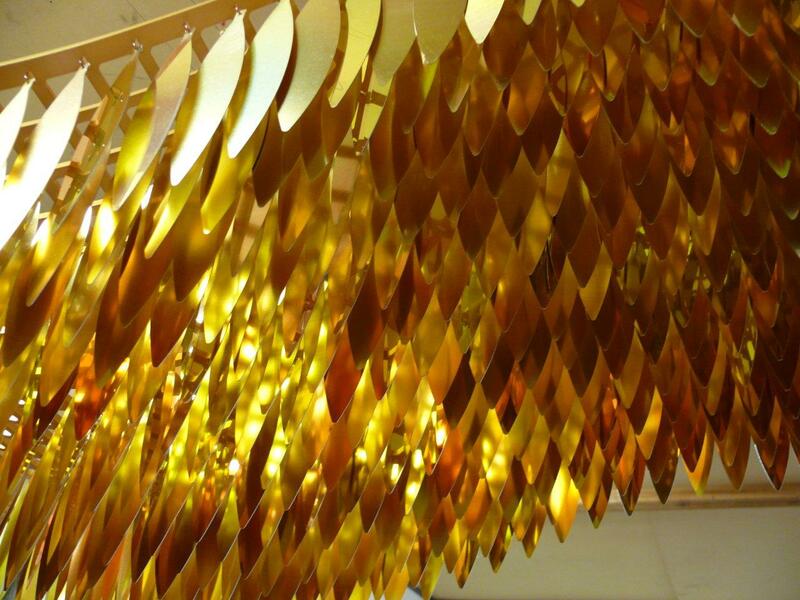 Here at YGD, we love design and we love our biggest fans (we’re looking at you, readers!). Our focus is not only creating authentic designs but creating and maintaining relationships with our fan base. Let’s face it: hospital lighting doesn’t have the best reputation. 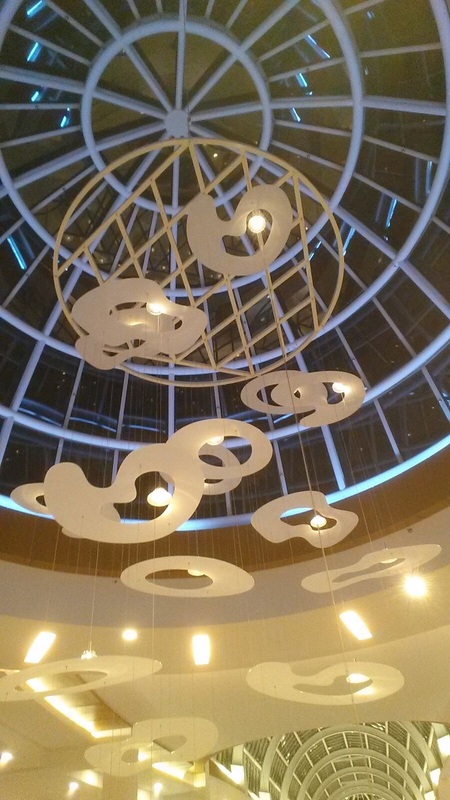 Describing an interior as “sterile” isn’t exactly a compliment to any space (even for hospitals!). Those typical bright white fluorescent lights aren’t exactly what we would call “welcoming.” Problem is… if medical attention is required, there is no avoiding it. 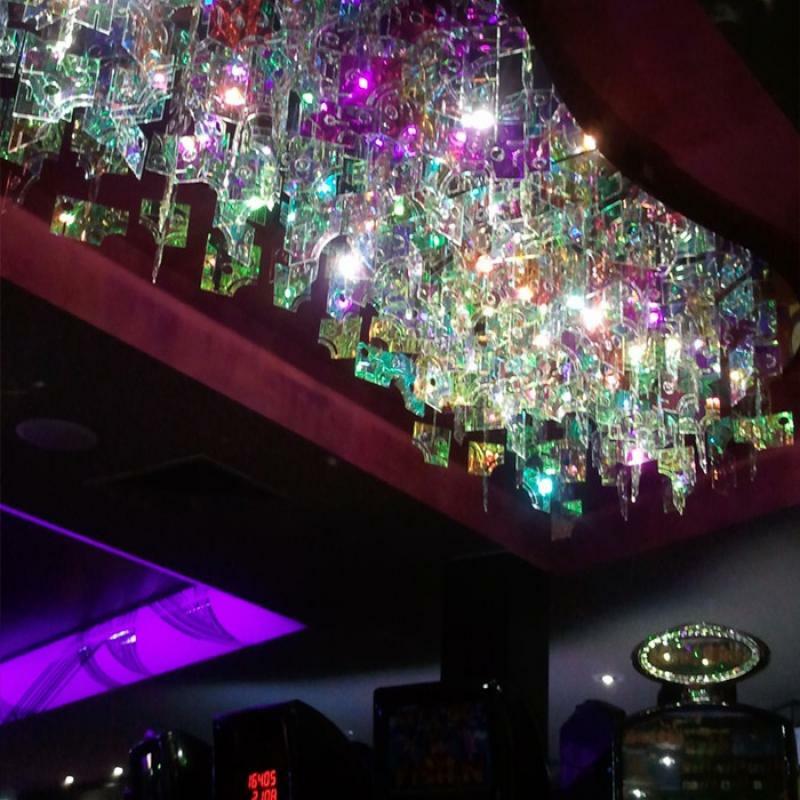 Why do hotels and retail spaces get to have all of the fun?! Not any more (mic drop from the healthcare industry!). 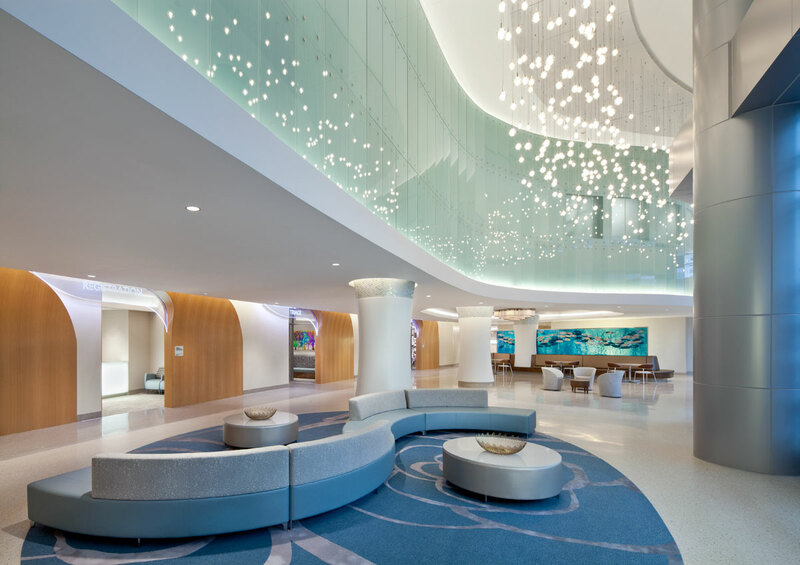 Healthcare is bouncing back and Yellow Goat Design is at the forefront of elevating the interior experience for patients and providers alike. If you don’t try new things, you certainly aren’t going to benefit from them. Sticking to the tried and true can make you feel tired and blue at the end of the day! In terms of design, your project will feel flat and generic if you cling to the cookie cutter concept. Good design, in addition to looking great (obviously), creates a conversation, lends a feeling of distinction and destination and sometimes even causes a good laugh. 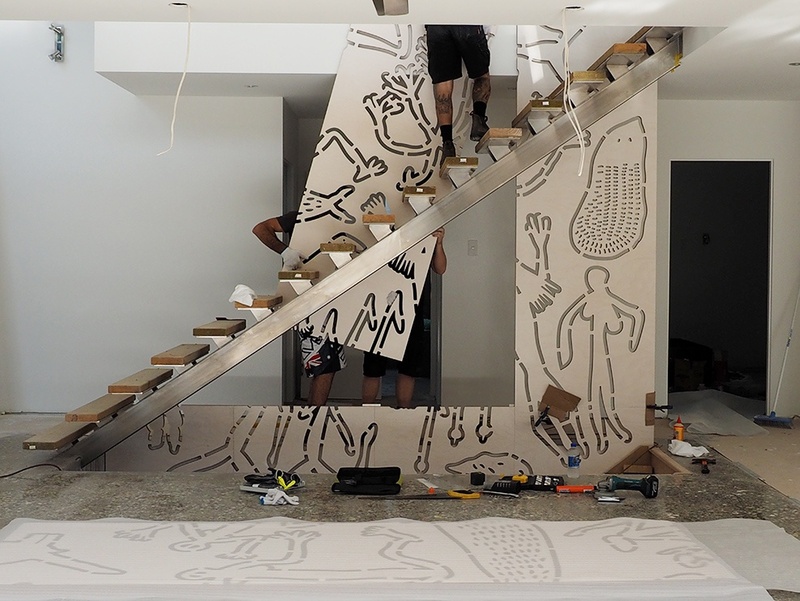 We think you should go big or go home in your next interior design project. There is a reason the song ‘Puttin’ on the Ritz’ was so popular that it stayed in our minds forever – and why we say something is “ritzy” when it is classy and glamorous. The Ritz-Carlton hotel brand truly embodies this concept and has done so for decades - their luxury suites have been around since even before the First World War. Yellow Goat Design: Who Wore It Better? 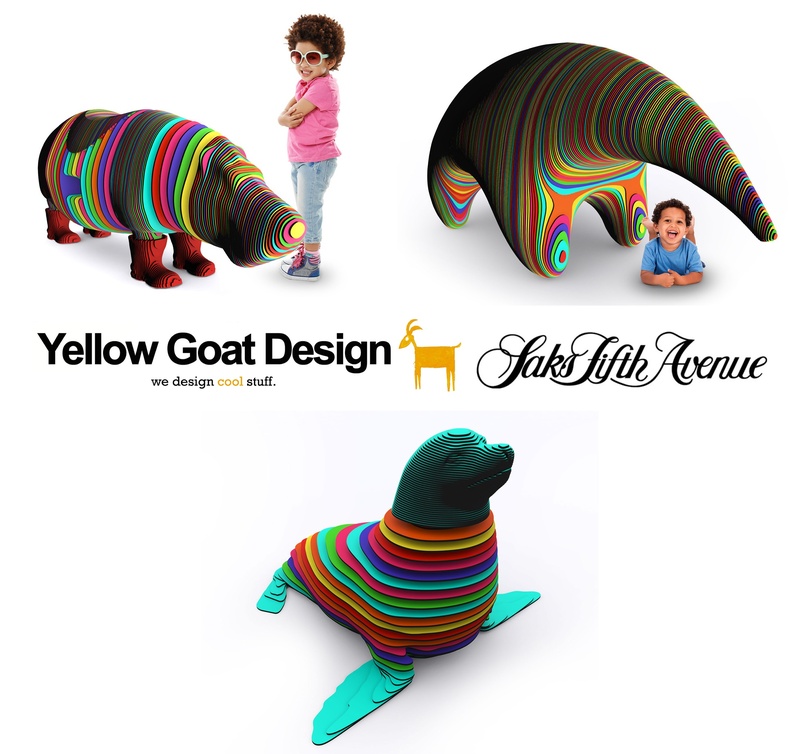 Yellow Goat is known for its creative and overly unique designs. Our team of bold thinkers take risks and reap the rewards of being daring and exceptional in the design industry. Our clients know, and have come to expect, that our ideas are different and set their projects apart from the competition. 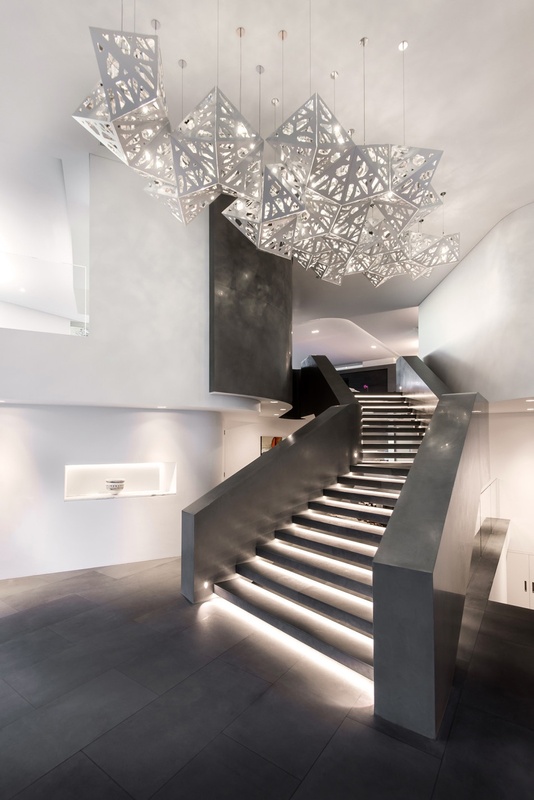 Put to the Test, Nominated as the Best: Introducing YGD’s “Nest”! 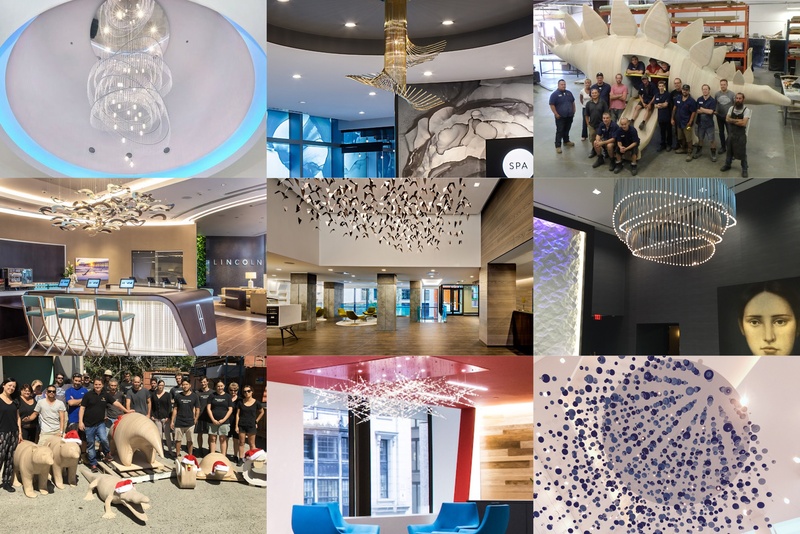 We don’t mean to brag (or maybe we do), but with several Interior Design “Best of Year” nominations and awards, we like to think of ourselves as true designers and innovators of custom lighting design. 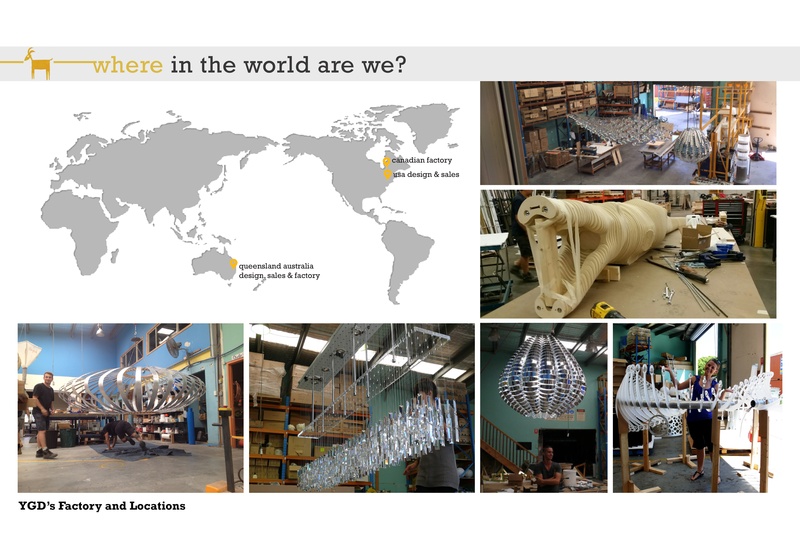 Yellow Goat Design is one of the leaders in interior lighting, design, and spatial planning. We get a lot of queries and questions from our clientele and are always more than happy to answer them. With that in mind, we thought we would compile the most popular and frequently asked questions into one simple list to help you better understand what we do and how we do it. 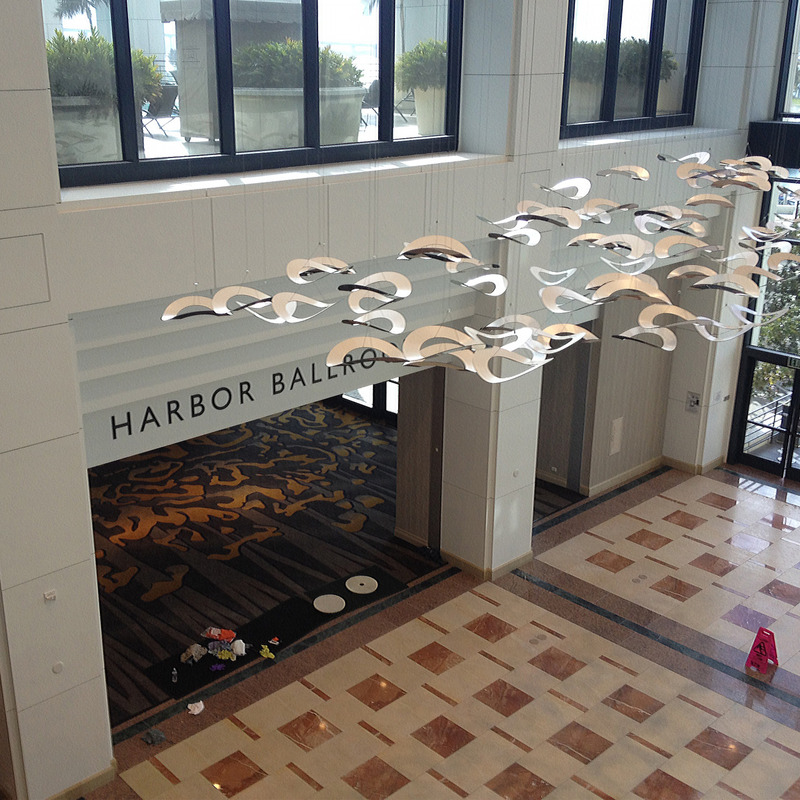 Quite often, the most interesting play areas in a hotel, office or retail store do not even look like play areas. 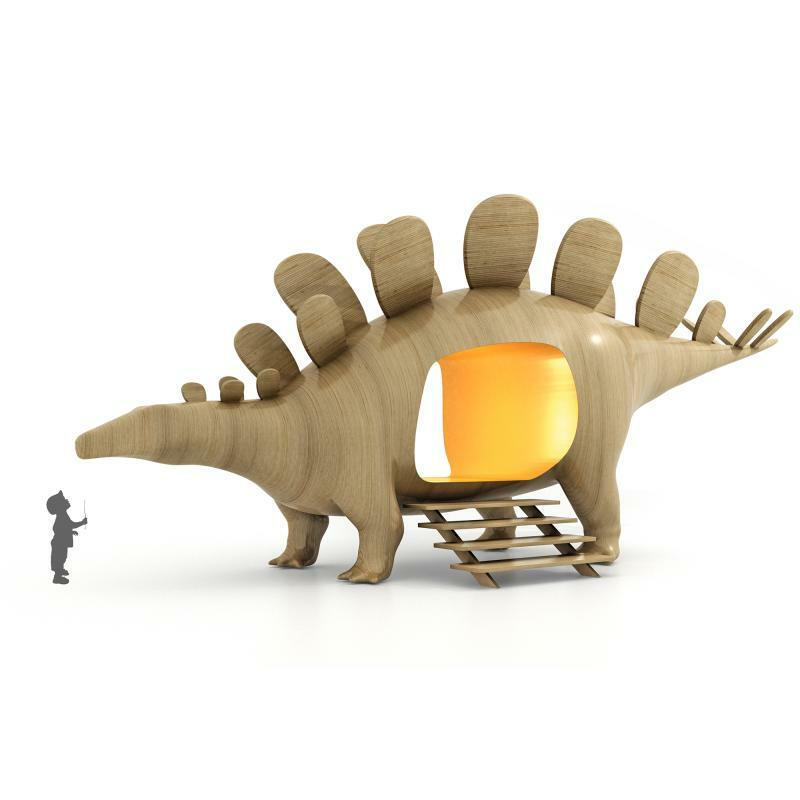 A play area that is artistically integrated with the surroundings will be more exciting for the children and easier on the eyes for the adults. 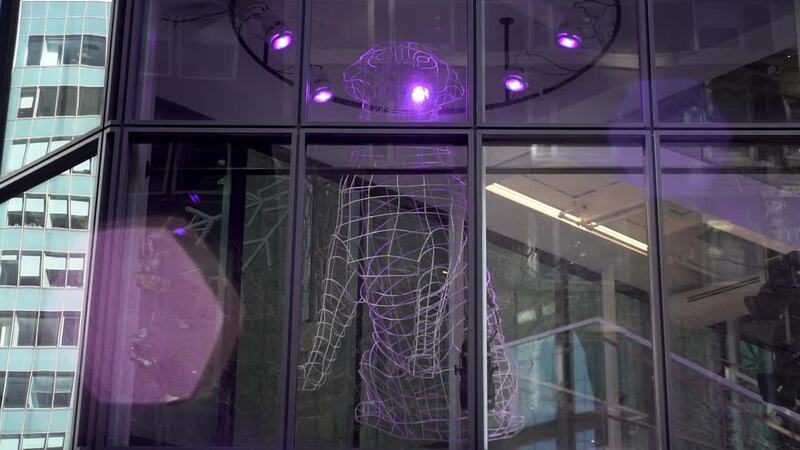 If you’re looking for a way to make a unique statement in your business, lighting is one area where you can afford to be bold. 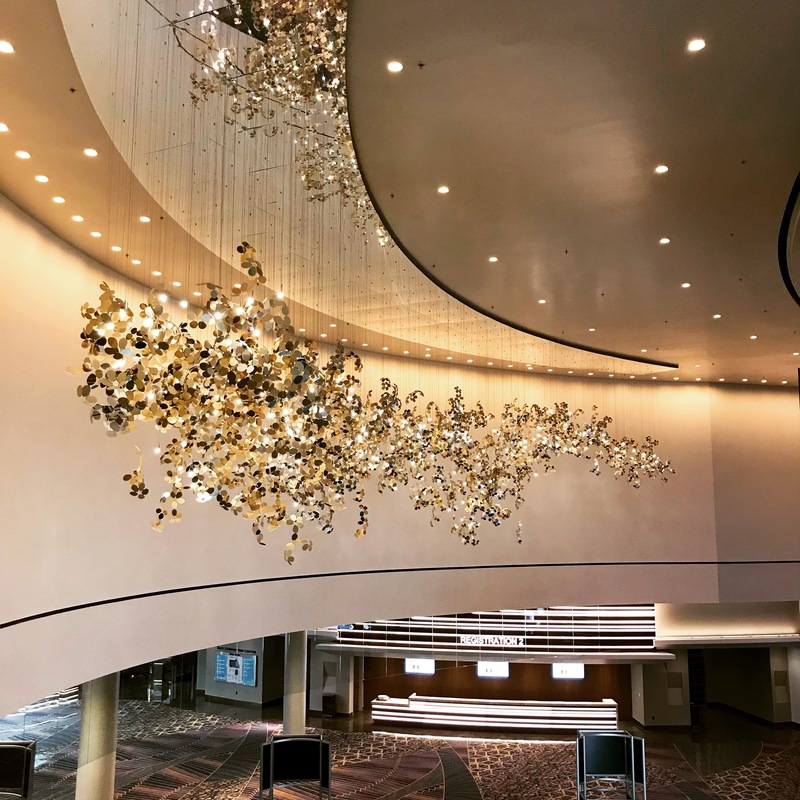 Having a strong artistic statement in your foyer, your lobby, or any other communal space can leave your guests with a lasting impression, and lighting is the key to making any space come alive.